Jim looks great in those Mary Janes. Woohoo! I got me a MomoFali Level 0 Patch! I assume that's O for Outstanding. Love you, Momo. Love you HARD! That's one cool posse you've got. Do they serve beer in the hospital cafeteria? Let's go! And a few who would probably help you move a body! I would drive you to the hospital in a heart beat Momo. 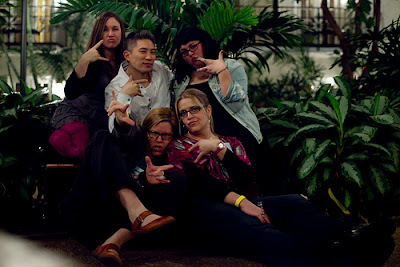 Your bloggy friends are so GANGSTA! Seemingly minor health problems can really put a damper on things. But it's good that you have plenty of people who care about you should anything happen. Oh, wincing. Viral meningitis is SO not fun. Thank heavens for your good friends (and wishing I could be one in person for you like them).